It’s Cultural Pass day here, which means the classes at the school studio are free, so of course I grabbed an extra class. Advanced Class ends at 10:30, leaving me two hours to sort out before Beginning/Intermediate class. I ran some errands, then settled down to watch the Intro class. Not free, because it’s in the main studios downtown and attracts a different crowd. It was fascinating: there were a couple of ringers in there (one girl from BG’s Spring Collection, one girl who I’ve seen in every class but Advanced), but many of the dancers were clearly new, and they all used different strategies. Some of them sketched the idea of the steps, dancing through the combinations even if they aren’t yet entirely technically correct. Some of them worked with great precision, focusing on placement and articulation, even if it means the feeling of dancing isn’t quite there yet. Some fell somewhere in between. I would wonder which strategy works better, only I think you have to use the one that works for you. I’m evolving into a technical dancer, but I’ll always belong at heart to Team Just Flail On Through; Team Fake It ‘Til Ya Make It. My friend T, meanwhile, belongs to Team Build It ‘Til You’ve Killed It (in a good way). She’s only been dancing for three years, but I admire her lovely placement and her beautiful precision. Anyway, both classes went quite well today, though I had issues remembering the grand allegro in advanced class. He’s the second person who’s said that to me in the past twelve months or so, and it means rather a lot coming from him (meant a lot coming from Dr. K, too). I used to be really nervous around him, because he’s so freaking good. I don’t have quite the level of Hero Worship going on with him that I do with BW, but I also haven’t seen him dance as much. In BG’s class, everything went smoothly and well (okay, except the part where my left shoe twisted during a turns combination). —and those sissone faillie, assemblé bits finally felt good. I also managed not to turn my grand assemble en tournant into entrelacé. Much as I can do any turn inside out and backwards, I can turn almost any jump with rotation into entrelacé. SMH. Anyway. I’m back to feeling like a reasonable ballet boy with a reasonable dose of talent. Turns are improving (did a double en dehors in attitude from 4th today by accident whilst marking a turny adage; couldn’t reproduce the result, but at least I know it’s physically possible for my body now 😛 Jumps are improving. Turny jumps, unsurprisingly, are also improving. Even my arms are getting their act together, bit by bit. I really wish I could repost BG’s video from the class with all the sissones—the bit where I, like, flap my arms when I start to get tired is pure comedy. Swan lake, indeed. More like Pelican Beach. Pelicans are heckin graceful once they get going, but their departures and arrivals tend to be less than balletic. So that’s today. JMG tomorrow, and I’m probably going to sign up for this week’s masterclass, since I’m here. I think it’s well worth the $100. I’m hoping to take Philip Velinov’s as well, but that depends on auditions. Oh, and I managed to do the dreaded attitude tour lent en dehors straight into attitude tour lent en dedans without falling over. That was in JB’s class; in BG’s,we did the same thing, but at passé, AKA the single hardest way to do tours lent. So there’s that, too. Tour lent is often called promenade, but our AD reserves the term promenade for the partnery version. Set two more segments of the dance tonight and ironed out half the costuming issue. I say “set,” but they’re really only half-set, as we didn’t run them with music (we were all too tired to screw around with all that). I did set them with the music in my head, though. I have another phrase in my head, but I don’t feel like I’m quite hitting what I’m trying to say, so I’m going to sit on that one this week. This piece is very adagio and really quite serious, which means we need to approach it a little carefully to prevent accidental silliness. ^This is actually right at the beginning of this dance. Which is good, because this movement begins on one knee and one foot and involves pressing sloooooowly up into attitude without falling on each-other. 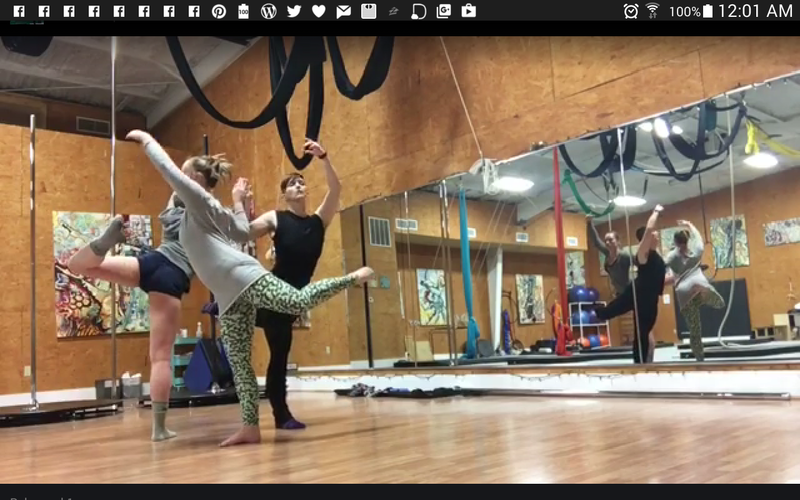 The supporting leg basically does all the work getting you from “on bended knee” up to attitude (and then you arabesque, and then you penché, and then you failli…). In short: engage all the things. Definitely the kind of thing you want at the beginning rather than the end (not that I’m any nicer at all to us about the end). It’s a screenshot from a video, btw, hence the slightly pixelated image quality.